Dr. Robert T. C. Goodwin is a research and teaching fellow at University College London. His first trade book, Crossing the Continent 1527–1540: The Story of the First African-American Explorer of the American South, was published in 2008 to critical acclaim. He appears on Spanish radio and TV. He lives between London and Seville, where he regularly conducts archival research. 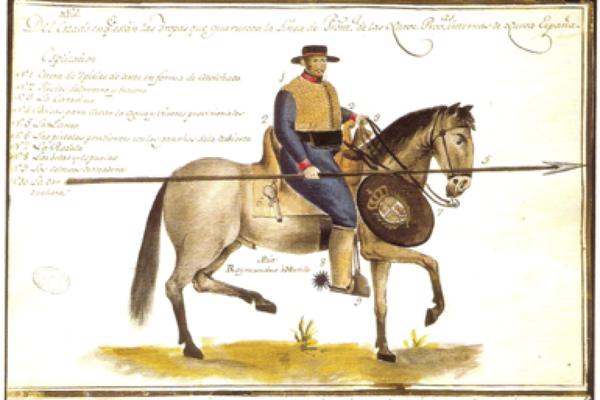 Ramón Murillo, Soldado de Cuero, 1804. (Archivo General de Indias, Seville: Mapas y Planos, Uniformes, 81; Wikipedia Commons). Spaniards responded to the unfolding story of the American Revolution with a mixture of trepidation and schadenfreude. Britain was Spain’s dangerous imperial rival. Britain had humiliated France and Spain in the French and Indian War. So Spaniards much enjoyed England’s crisis. But in 1775, the Count of Aranda, the Spanish Ambassador to Versailles, presciently warned the government in Madrid that whether the Thirteen Colonies secured their independence or not, “we must view them as a rising power born to subjugate us.” In due course, he believed, whatever the outcome of the war, this terrifyingly bellicose population of mostly English-speaking, largely Protestant, northern Europeans would march across America, their Anglo-Saxon sights firmly fixed on the silver mines of Mexico. Aranda preempted Manifest Destiny by three-score years and ten. He even identified the Red River as the likely invasion route, which would have led his imaginary army of alien heretics to the relatively prosperous community of 5,000 souls at El Paso, then famous for its aguardiente, literally “firewater.” Somewhere in New Mexico or Texas this phantasmagoric force would have been confronted by the first line of Spanish imperial defense, the garrisons of soldados de cuero, tough mounted border guards named for their leather armor. In 1772, Charles III of Spain had ordered a major reorganization of the forts known as presidios and their garrisons of “leather-jackets” which were supposed to control and protect the northern reaches of the viceroyalty of New Spain (modern Mexico). The plan required a chain of presidios, each with its own well-equipped garrison, set one hundred miles apart. This “rampart” was to run from California to Texas following more-or-less the same line as the modern international border, with the exceptions of the outlying settlements in northern New Mexico and at San Antonio de Béxar, Texas. This was to be the frontier of Spanish occupied territory, beyond which lay Indian country which was nonetheless claimed by Spain. Thus, King Charles’s Regulation of 1772 sought to establish an eighteenth-century Spanish predecessor to the contentious modern border wall. That ancestry is not without obvious irony, for the express purpose of this “Spanish wall” was, as Charles III stated, “to defend those borders and the lives and livelihoods of my vassals” in the modern Mexican border states of Sonora, Chihuahua, Coahuila, and Tamaulipas “from the barbarian nations” invading from the north. These “barbarians” were not hoards of British-Americans from the East, however, but Native Americans whose descendants are now US citizens. Northern New Spain had been devastated by highly mobile Apache and to some extent Comanche raiding parties from southern New Mexico and Texas that had repeatedly assailed settlements in northern New Spain. Their violence had caused large numbers of Hispanic settlers, mostly indigenous Mexicans or mixed-race castas who had emigrated from elsewhere in New Spain, to abandon their isolated farms and communities, causing massive depopulation and the dislocation of people across the region. Behind this immediate threat from Native Americans, the distant but ever-present menace posed by Britain and the Thirteen Colonies did indeed lurk. The expanding population of British America created westward pressure on the Indian population that expressed itself as Comanche and Apache aggression when it came up against the Spanish world. Moreover, these Indian raiders acquired weapons and ammunition from trading networks that originated in the Thirteen Colonies, although they bought some from traders in Spanish Louisiana, to the disgust of the viceroy in Mexico City. So, while the Spanish border “wall” was not conceived of as a defense against British or American invaders, itwas a response to the consequences of American demographic growth and fast developing commercial relations with Native Americans. Moreover, as Aranda’s warning exemplifies, Spaniards believed that they would soon have to confront a direct British or American trespass on their territory. Before the Revolutionary War, that threat was most tangibly present in Louisiana (ceded to Spain by France in 1763), where British West Florida was just across the Mississippi. The government in Madrid sought to create a bulwark against British-American expansion by building a series of alliances with the different Native American tribes who controlled most of the territory on both sides of the Mississippi. In 1769, the acting military-governor of Louisiana, an Irish-born army officer called Alejandro O’Reilly, convened a great Indian Council at which he met with chiefs from almost all the tribes living within two-hundred miles of New Orleans. He smoked the peace pipe with them and listened to their professions of friendship. He extolled the benign but awesome power of Charles III and then hung gold medals bearing an image of the king around the necks of the nine most important chiefs. Fears of a British or American invasion of Spanish North America convinced Spain to maintain an ambivalent approach throughout the Revolutionary War. Madrid gave the rebels just enough support to prolong the conflict in order to weaken both sides, until the Spaniards finally entered the war, not as allies of the rebels, but in order to secure control of the Mississippi and the Gulf Coast. That policy succeeded. In 1783, at the Peace of Paris, George III ceded both East and West Florida to Charles III, giving Spain control over the Mississippi and the Gulf of Mexico. The Peace of Paris also created a troubled and porous frontier with the newly independent United States along the Saint Marys River. In the Florida, the disembodied specter of American invasion that had been invoked by Aranda manifested itself as real humanity on the ground. These were not the grand armies he had envisaged descending the Red River. In 1790, the new Spanish governor at Saint Augustine, Manuel de Zéspedes y Velasco, railed against “a species of white renegade, known as Crackers,” in a report sent to Spain. Their “wish to escape the authority of the law is so strong that they prefer to live in Indian... or Spanish territory rather than under the yoke of civilization.” They “are nomadic like Arabs and can be distinguished from savage [Indians] only by their complexions, their language, and the depraved superiority of their cunning and bad faith. As skilled as Indians when hunting, they will risk crossing great rivers on flimsy rafts, and can track man or beast through the thickest woods.” These “Crackers” trespassed across Spanish territory and occupied Indian lands, yet “far from opposing these land grabs,” Zéspedes complained, “the southern states of America encourage them, motivated by the desire to expand their frontiers and gain control over foreign lands”. In 1785, the American general Nathaniel Greene made a surprise visit to Saint Augustine, where he much enjoyed the liberal generosity of Manuel de Zéspedes’s table. Greene wrote his wife that perhaps “two hundred dishes of different kinds [were] served up in seven courses,” all washed down with a “variety of Spanish and... French wines.” After “five hours,” he confessed, “I was not unlike a stuffed pig”. Greene did not visit Florida to have lunch, however enjoyable. Ironically enough, the ostensible purpose of his mission was to ask Zéspedes to help prevent Loyalist refugees from squatting and logging on Cumberland Island GA, where Greene had recently acquired the property which gained renown as Dungeness. More ironic still, Zéspedes reported to Madrid that Greene had in reality come to Saint Augustine not to complain about Tory vagrants, but to tempt formerly British Floridians newly subject to the Spanish Crown to settle and work his new estate. Skilled tradesmen like the carpenter Thomas Stafford, later elected to the State Convention of Georgia, and his brother Robert Stafford did indeed answer Greene’s call. Not only was America not sending Florida its best, it was stealing Florida’s best to boot.